Full disclosure: Jennie-O provided free product coupons for me to review these products and also for this giveaway. However, this is not a compensated post and the opinions expressed here are strictly my own. When a representative contacted me on behalf of Jennie-O products a while back, I immediately asked about their gluten-free products and then I wanted to know how they ensure those products are actually gluten free given the fact they also have gluten-full products. 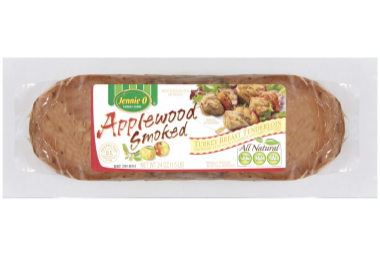 Here’s the listing of all Jennie-O’s gluten-free products (be sure to look around and click on “see more” if shown because this page is displayed differently in different browsers). And here’s the quick Q & A below on the discussion I had with the Jennie-O rep on what “gluten free” means to Jennie-O. 1) Does Jennie-O do any testing to ensure their products are 100 percent gluten-free? Yes, Jennie-O Turkey Store does have a testing process as part of our Allergen Control Program. Jennie-O Turkey Store’s gluten-free products comply with Government standards for gluten-free requirements. As a proactive control measure, Jennie-O Turkey Store invests considerable time and effort into verifying incoming ingredients, proper formulation, and proper labeling for the products that we produce. 2) How does Jennie-O ensure there is no cross contamination from their products that include gluten? 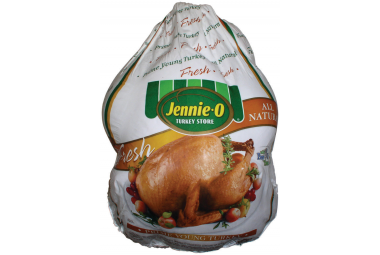 At Jennie-O Turkey Store, we have administered a strict Allergen Control Program since 1998. One of our primary goals in this program is to formulate our products so that they do not contain allergens. If we are producing products that are not allergen-free, those products are identified and segregated in our production processes. I’ve been buying a few of Jennie-O’s products for many years … ground turkey upon rare occasion (admittedly, when one has a supply of ground venison, there’s not much need for ground turkey … at least not in my opinion), turkey breasts once or twice a year, and the also rare whole turkey (my father has provided us with his bounties of wild turkey most years for holiday meals), and the occasional turkey tenderloin. That last one is purchased from time to time when the Jennie-O turkey tenderloins are on sale and we don’t need a large amount of turkey. I also use them to supplement large meals upon occasion. With some of the coupons I received from Jennie-O, I picked up two packages of tenderloins for our February support group meeting. Not surprisingly, these tenderloins were enjoyed by all. I’ve found the Jennie-O tenderloins to be perfectly moist and very tasty. It’s nice that you can buy them “plain” to season as you wish or already perfectly seasoned if you’d like (flavors include Savory, Lemon Garlic, and Smoked Applewood). Admittedly, I’m not keen on the fact that some of their products list words that sound too “chemical” for my preferences, but I use them so infrequently that I’m semi-okay with that. There’s not a long list of ingredients on most of the Jennie-O products that I occasionally use; I do like that fact. I urge you to do your own review of ingredients before you buy them to see if they fit your requirements. Plus, clearly Jennie-O’s “gluten-free” products are not “certified” gluten free, so you’ll have to use your best judgment on whether or not they are safe and right for you to consume. The lack of certification is not uncommon in “mainstream” naturally gluten-free products, but I did want to remind you of that for your consideration. ~ The GFE Mother Lode of Turkey Recipes plus there’s the source of most of the turkey used to create those recipes—my two-ingredient slow cooked turkey breast and my special turkey breast (be forewarned … the latter will most likely make you forsake all other turkey recipes) That amounts to 12 recipes in all, so there are a lot to choose from! But I wanted even more choices for you and I didn’t have to look hard. Here are more great turkey recipes from a number of my blogging buddies! Note that not all of these bloggers are exclusively gluten free, so please remember to use gluten-free versions of ingredients in each recipe if not already noted. Okay, even though it’s March, let’s talk some turkey now. I’ve always thought that turkey doesn’t get its due anyway. I’m a fan of turkey throughout the year, not just during the fall and winter holidays. Hopefully, you are, too! All you have to do to enter the giveaway is leave a comment stating your favorite way to use turkey. I get some of my very best recipe ideas and menu ideas from you guys, so I look forward to your comments. That’s all that’s required to enter this giveaway. If you want to share the giveaway with others (who doesn’t need some free “buying power” at the store, right? ), you can share the giveaway on Facebook, Twitter, and/or your blog and leave a separate comment for each for extra chances—those are optional entries. This giveaway ends Sunday, March 25, at midnight Eastern. I love to make Turkey melts with lots of cheese on my gluten free bread! I LOvE to make BLTTs…..Bacon, Lettuce, Tomato, and Turkey!! While sliced deli turkey (smoked or honey) is a staple for sandwiches in our home, I also love using the Jennie-O Italian Turkey sausage as the main ingredient in lasagna. Turkey breasts and tenderloins also work great in stir-fries. i love to make my own turkey meatballs! yum! My all time favorite use of turkey is Wild Rice Turkey Chowder. Yummmm…we love turkey throughout the year too. 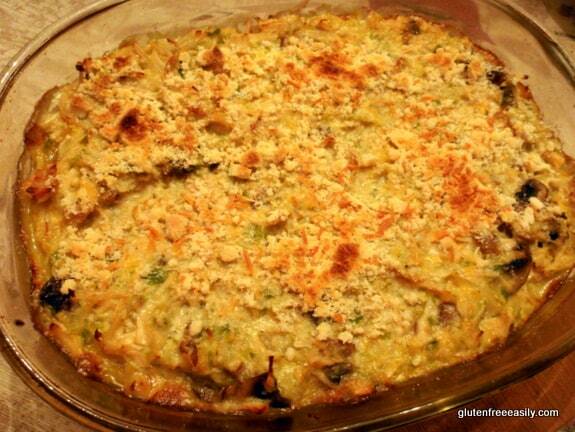 Your Turkey Tetrazzini sounds wonderful! Once in a while we can get free range turkey breasts – great to marinade! Shari needs to post the Wild Rice Turkey Chowder. It’s rainy today, and that looks like just the right antidote. Personally, I love turkey and had it with breakfast. My favorite way to have turkey is turkey stock….to me, there is nothing more delicious. Ok, probably there is, but soup on a chilly or rainy day is really in a class by itself. I have never heard of spatchcock chicken (or turkey) but it makes perfect sense. We love making tetrazzini with turkey leftovers and make sure we have some inexpensive white wine to use in the sauce. We make turkey meatballs and turkey chili! I love to make turkey tetrazini (not sure if I spelled that correctly) with my leftover turkey. It’s a meal I have made since my children were young. I’ve changed it to make it gf now. It’s the perfect meal to make for someone who is ill because it freezes really well. We so enjoy the tenderloins. We grill them for supper, then my husband uses the leftovers for his lunches. We have also make sausage out of ground turkey that we really enjoyed. This is a variation of a paleo soup made with chicken only with leftover turkey! Turkey/chicken stock, shredded turkey, heat together serve with a nice helping of cilantro, cut up avocado, a smidgen of jalapeno peppers. Delish! I like to use 1/2 ground beef and 1/2 ground turkey in my meatloaf. Keeps it leaner and no one notices a taste difference! Sage-infused turkey burgers are a favorite around our house. And of course, enchiladas, whether made with turkey or chicken are another family tradition. Thanks so much for linking to my enchilada recipe! PS Your 2 ingredient slow cooked turkey breast recipe sounds awesome! I know it’s boring, but I love a plain ol roasted turkey!! I like to make taco meat (I make my own taco seasoning) with turkey because it is so much leaner. I would love to try turkey sausage, I have the Alisa’s link and will try it tomorrow after I make sure I have all the seasonings. #1 is a delicious old fashioned turkey sandwich on Udi’s Chia Millet Bread! #2 is turkey meatloaf, just found the best recipe that adds apples to it, holy yum! The whole family LOVES it!! My favorite way to use turkey is in sandwiches smothered with (gluten-free) gravy! Looking forward to turkey on Easter. My favorite way to use turkey is to make turkey meatballs. We just use gf bread crumbs, eggs and seasonings and bake them in the oven. They come out so juicy and tasty. I also just love making a nice whole roasted turkey for a special dinner with family. Since I am diabetic & gluten-free, I try to be very careful with what I consume. I don’t eat red meat, so I eat a lot of turkey. I use ground turkey in my chili (of course), breakfast casseroles and such, but I also pan-fry my turkey tenderloins (coated in a little seasoned GF flour). I’m the only GFE person in this 4-person household, and the rest of my family thinks they’re eating delicious pork chops! Sometimes I cook for just myself, and other times I cook for all 4 of us. Should I tell them they’re eating turkey? LOL! Keep sending those recipes! My family loves turkey chili! Our family weekly tradition is “Taco Tuesday”. I always use ground turkey for the meat in the tacos. It’s my families favorite!! We use ground turkey to make chili, meatballs, meatloaf, tacos,stuffed peppers; basically everything! We like to make turkey burgers with all sorts of different seasonings. Our faves are greek-style or with carmelized onions and swiss cheese. I love to throw it in the crockpot and then do a make your own quesadilla bar with my quesadilla maker there is good gluten free tortilla shells out there its my new staple instead of bread. I made an apple turkey burger a few years back that was very good. I’d like to try that again with your son’s great idea to use your biscuits or flatbread as the bun. Yummy!!! I have Celiac disease and am always looking for new gluten free recipes. Turkey is a staple in our house. I use ground turkey wherever I would use ground beef and turkey cutlets in any recipe that I would use chicken in! I love to make turkey quesadillas and smoking the whole turkey! Already like GFE on facebook! We love marinated turkey tenderloins on the grill. I also couldn’t live without turkey Italian sausage on pizza! I make meatloaf, meatballs, and wimpies with the ground turkey…yummy!! Love, love, love the turkey sausages (both the hot and sweet). I use them in eggs for breakfast, for turkey meatballs in spaghetti sauce, and chopped up in stir fry. Big fan! I like turkey with mashed potatos! I like turkey sandwhiches too! Turkey sausage and turkey bacon are great additions for breakfast foods! We love turkey chili in the crockpot with homemade chili seasoning. I don’t use turkey much other than for sandwiches and the traditional thanksgiving version I’m excited to try some other variations though. What a wonderful round up of recipes. Not sure where to start – they all look so good. Thanks for including me Shirley!!!! Like you, we usually have a freezer full of venison, but when it starts getting low, I love to use ground turkey especially for chili, spaghetti, or tacos! recipe at least once to mix it up a little. I like to make turkey sammies just like after Thanksgiving with mayo, lettuce and cranberries! I love Bobby Flay’s turkey burgers (the recipe is on foodnetwork.com). I use turkey for all our family favorite dishes that call for beef. It is versatile, tasty and a wonderful alternative. I love the GF Jennie-O products, especially their burgers! I love Jennie-o, we buy it all the time. Their Turkey Ham is a staple in the house, the kids eat it all the time. I love to make enchiladas or turkey salad. Love the leftovers! Great giveaway, thanks! Being from NM we love to use turkey for enchiladas! 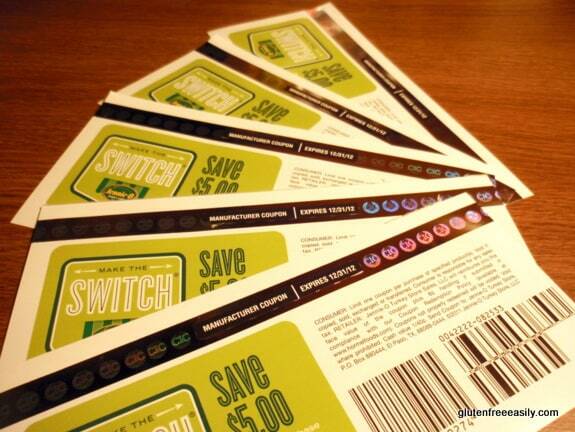 🙂 We’re just discovering Jennie-O’s variety of GF products so these coupons would definitely be useful. Thanks for another wonderful giveaway, Shirley! Thanks for the Jennie-O coupons! My teens will be thrilled since we normally have turkey only a few times a year. Thanks, Shirley, for this wonderful blog with all of the information and recipes for those of us with celiac and/or gluten intolerance (we have both). Wow, I won. Thank you so much for blessing my family. I can’t wait to prepare some more turkey for my family. Have a blessed day. Thanks so much, Shirley! It’s always fun to win something. I missed out on having a whole turkey last Thanksgiving so maybe this is fates’ way of saying it’s time!